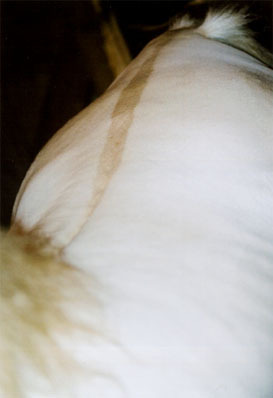 This dorsal stripe belongs to Finally's Mr. Amos, a gorgeous dun perlino Morgan stallion. A photo of Mr. Amos is below, and he can be seen on the perlino page. 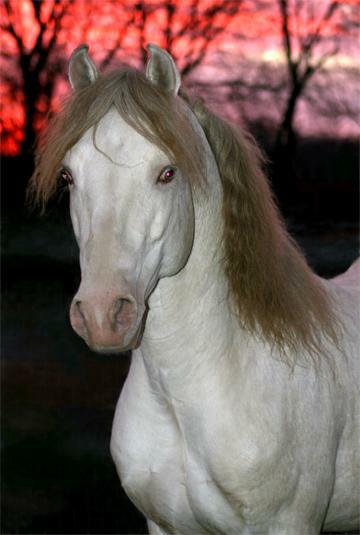 Both of Amos’ parents were buckskin and he inherited a cream gene from each of them, and also a dun gene from his dam. Amos is the only perlino dun in the Morgan breed at this time. Thank you to Lynn Peterson of Royal Gold Morgans for allowing me to display this photo.